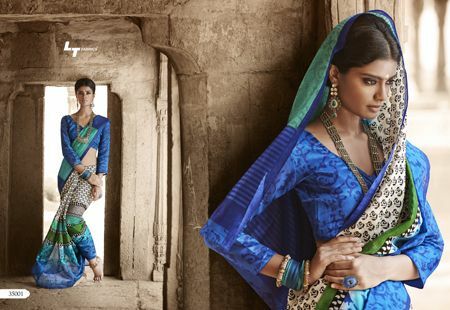 I was attending a Diwali party last week and the most entertaining aspect for me was analysing the sarees that literally ‘made up’ the room; the faces cease to exist (well, for a moment or so!) and all that fluttered in front of my eyes, were the flowing figurines in yards of colourful fabrics. Some of which were beautiful while others, well….they are best not spoken about! If my memory serves me right, I think silk was the most worn fabric that day, while the likes of ‘net’ and other synthetic fabrics popped around too. 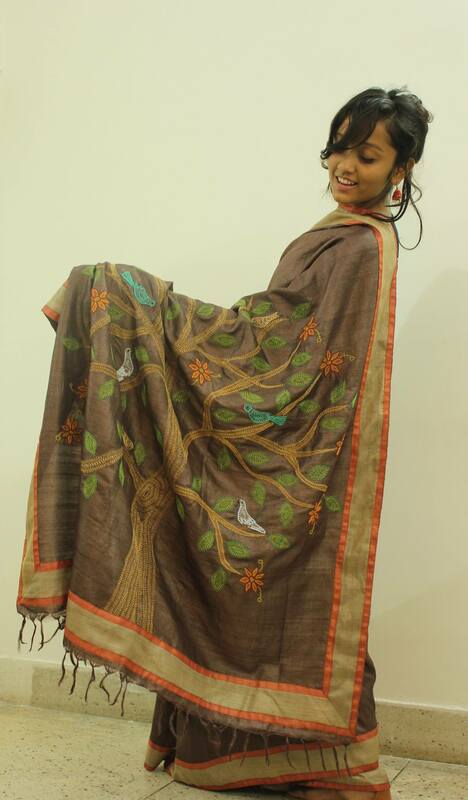 I am not a big fan of ‘net’ sarees, hence I will save my breath and use this post to talk and shout about a fabric that I am rather extremely fond of and which happens to be simple, slighlty rustic, perfectly elegant tussar silk! Well, it is the season for celebrations, weddings and parties and with the weather getting colder, it’s time to bring your favourite, classy silks out of that wardrobe. The ever so elegant tussar can be worn all year round and looks absolutely stunning, whatever the weather. 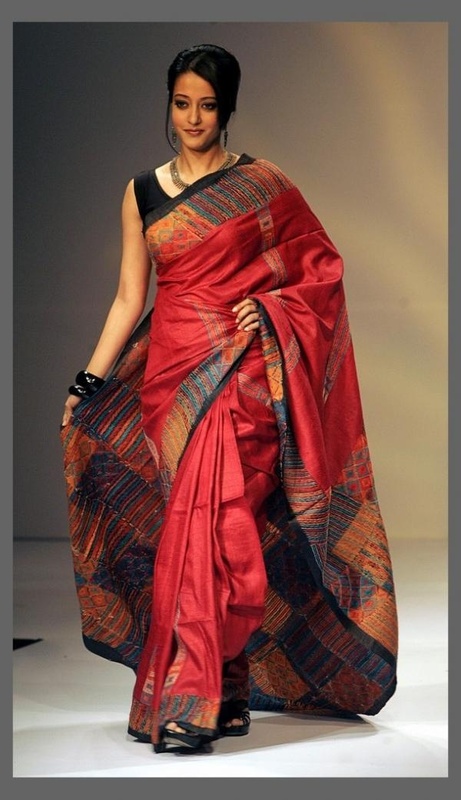 This post is going to be about my all time favourite, easy-to-drape and stylish silk from Bhagalpur, which is a city on the banks of the river Ganga, in the state of Bihar in India. One of the processes for silk production in Bhagalpur entails that the silkworm used to spin the silk is not killed in the process, unlike a lot of other forms of sericulture. Now, isn’t this a brilliant reason to drape more of this cruelty-free silk? Fascinating? 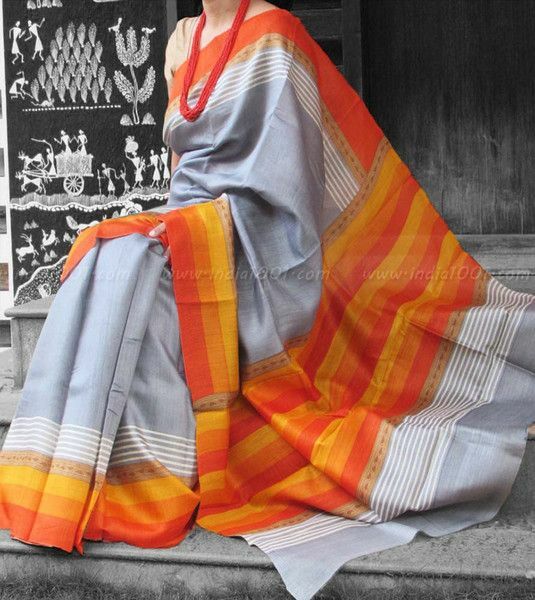 Well, going back to talking about this wonderful silk, ‘Tussar’ or ‘Tussah’ from Bhagalpur. The by-product and waste of Tussar production are used very carefully to spin the yarns like Ghicha, Katia and Jhuri among other., all of which are extremely elegant and beautiful to drape. Ghicha is a hand-drawn coarse yarn, which is produced by pulling a bunch of threads by hand from one or two cocoons at a time and reeled on an earthen pot. Typically used as a weft yarn with silk or cotton to create magical Ghicha drapes. Everyone must own one Ghicha! 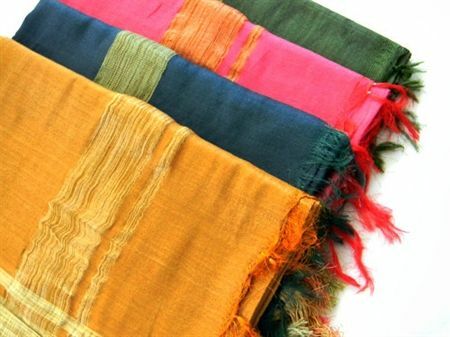 The poor but skilled handloom weavers in this region are fully familiar with handling these wide varieties of silk yarns. Perhaps this is the specialty of Bhagalpur weavers, which may not be in other handloom areas of India or even in Asia according to some experienced exporters. So, in my opinion, these amazingly crafted people should be treasured and treated well but I hear that quite a few of the younger generation are leaving Bhagalpur for earning a living in the bigger cities, which is a big shame! Thankfully, there are quite a few organisations such as ‘Berozgar Mahila Kalyan Sansthan‘, ‘Srijani‘ that are working to give the artisans and weavers working in various silk clusters a good standard of living; also these are helping to promote this silk across the world. Before I take you on a visual tour, let me share a little secret that I learnt only a little while back while speaking to a group of weavers from a cooperative in Bhagalpur on how to identify pure silk: Take a few threads from the warp and the weft and set their ends alight. When they are fully burnt, smell the ash. If it smells like burnt hair, you have just burnt some pure silk. If it doesn’t, and in fact the residue is solid, it is not silk, but some synthetic material. Be careful not to set the entire store on fire, though!